The Rt Hon Malcolm Bruce MP was the esteemed guest and speaker at a lunch given by the Rotary Club Marbella-Guadalmina on August 4th 2011 at the Restaurant El Cortijo de Guadalmina. Amongst the Rotarian members and their invited guests were D. Federico Vallés representing Dna. 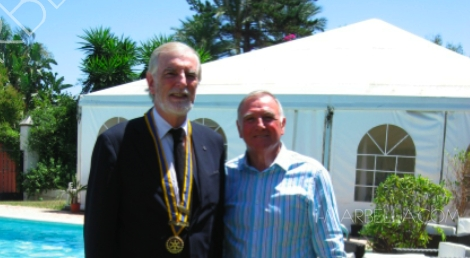 Angeles Muñoz, Mayor of Marbella, and Sr. Joachim Langhans, President of Rotary Marbella. As past Chairman of the House of Commons Select Committee on International Development, Mr. Bruce gave a most illuminating and interesting speech on how the British Government sees its role in helping developing countries and the financial contributions that they can offer in these troubled economic times. The Rt Hon Malcolm Bruce is currently on holiday on the Costa del Sol with his young family, and is greatly enjoying Marbella and local areas of interest.